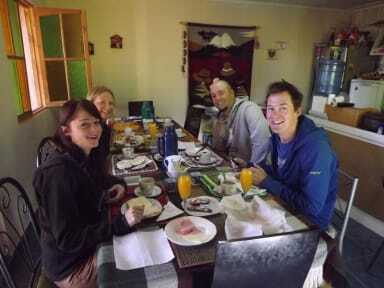 Our hostel has eight spacious, comfortable rooms, with excellent beds and beautiful furnishings. 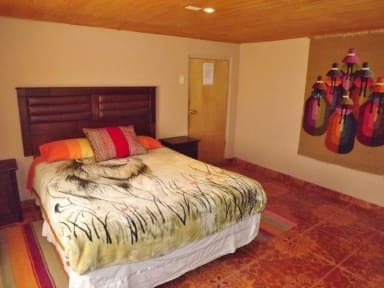 These include two rooms with full beds, private bathrooms, and television, as well as a triple room (three twin beds) and a quadruple room (full bed, twin bed, and a common area) with a shared bath. Hostal Candelaria also offers travelers a shared kitchen, beautiful tree-covered terraces with hammocks, parking, laundry service, the best Wi-Fi in town, and an excellent breakfast. If you let us know ahead of time via e-mail when you expect to arrive in San Pedro de Atacama, we can pick you up at the bus terminal. We're located just a ten minute walk north of the town's Plaza de Armas, in a quiet residential neighborhood.